Fred Schulte and June Arney of The Sun newspaper of Baltimore for â€œOn Shaky Ground.â€ They uncovered an obscure, colonial-era law that was being manipulated by lawyers and ruthless landlords to force hundreds of people out of their homes. This category recognizes excellence in reporting. It honors the enterprise, exclusive reporting and intelligent analysis that a magazine exhibits in covering an event, a situation or a problem of contemporary interest and significance. Esquire: David Granger, editor-in-chief, for The School, by C.J. Chivers, June. Fortune: Eric Pooley, managing editor, for The Law Firm of Hubris Hypocrisy & Greed, by Peter Elkind, November 13. IEEE Spectrum: Susan Hassler, editor-in-chief, for Re-engineering Iraq, by Glenn Zorpette, February. Rolling Stone: Jann S. Wenner, editor and publisher; Will Dana, managing editor, for Inside Scientology, by Janet Reitman, March 9. Time: James Kelly, managing editor, for One Morning in Haditha, by Tim McGirk, March 27; The Shame of Kilo Company, by Michael Duffy, June 5; The Ghosts of Haditha, by Michael Duffy, Tim McGirk and Aparisim Ghosh, June 12. This category recognizes journalism that sheds new light on an issue of public importance and has the potential to affect national or local debate policy. The Atlantic Monthly: James Bennet, editor, for Declaring Victory, by James Fallows, September. Best Life: Stephen Perrine, editor-in-chief; David Zinczenko, editorial director, for Our Oceans Are Turning Into Plasticâ€¦Are We? by Susan Casey, November. New York Magazine: Adam Moss, editor-in-chief, for On the Rabbiâ€™s Knee, by Robert Kolker, May 22. The New Yorker: David Remnick, editor, for three articles by Seymour M. Hersh, The Iran Plans, April 17; Last Stand, July 10 & 17; The Next Act, November 27. Vanity Fair: Graydon Carter, editor, for Rules of Engagement, by William Langewiesche, November. This category recognizes excellence in feature writing. It honors the stylishness, flair and originality with which the author treats his or her subject. Esquire: David Granger, editor-in-chief, for Sgt. Wellsâ€™s New Skull, by Brian Mockenhaupt, April. Esquire: David Granger, editor-in-chief, for The Loved Ones, by Tom Junod, September. GQ: Jim Nelson, editor-in-chief, for The Other Side of Hate, by Andrew Corsello, July. The New Yorker: David Remnick, editor, for Prairie Fire, by Eric Konigsberg, January 16. The Paris Review: Philip Gourevitch, editor, for In the Sandbox, by Glyn Vincent, Spring. This category recognizes excellence in profile writing. It honors the vividness and perceptiveness with which the writer brings his or her subject to life. Cincinnati Magazine: Jay Stowe, editor, for Is Bill Cunningham a Great American? by Kathy Y. Wilson, November. National Geographic: Chris Johns, editor-in-chief, for Murdering the Impossible, by Caroline Alexander, November. New York Magazine: Adam Moss, editor-in-chief, for Karl Lagerfeld, Boy Prince of Fashion, by Vanessa Grigoriadis, February 13. The New Yorker: David Remnick, editor, for He Knew He Was Right, by Ian Parker, October 16. Vanity Fair: Graydon Carter, editor, for A Face Only a President Could Love, by Todd Purdum, June. This category recognizes excellence in essay writing on topics ranging from the personal to the political. Whatever the subject, it honors the authorâ€™s eloquence, perspective, fresh thinking and unique voice. Foreign Policy: MoisÃ©s NaÃ­m, editor-in-chief, for The First Law of Petropolitics, by Thomas L. Friedman, May/June. The Georgia Review: Stephen Corey, acting editor, for Russell and Mary, by Michael Donohue, Fall/Winter. New Letters: Robert Stewart, editor-in-chief, for The Beautiful City of Tirzah, by Harrison Fletcher, Winter. The New Yorker: David Remnick, editor, for Alice, Off the Page, by Calvin Trillin, March 27. Smithsonian: Carey Winfrey, editor-in-chief, for Living with Geese, by Paul Theroux, December. As of today, the NYTimes is making its TimeSelect material (basically, NY Times columinsts) available for free to faculty and students. Don’t forget that Todd Library will be open our regular hours during Spring break. Need to start that research? Or need a quiet place to study or meet with a group? We’re open for you. Natural causes : death, lies, and politics in America’s vitamin and herbal supplement industry by Dan Hurley. From Midnight to Dawn : the story of the underground railroad and the flight to freedom by Jacqueline Tobin (with Hettie Jones). 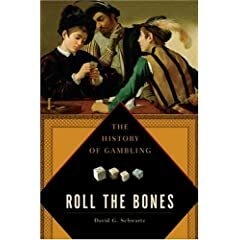 Roll the bones : the history of gambling by David G. Schwartz.